Baylor will now be recognized university-wide by its traditional, iconic “interlocking BU” logo, a mark with roots dating back more than 100 years, long before its use by the athletics program in the 1950s. Additionally, the entire campus and all athletics teams will now use a consistent green and gold – Baylor Green and University Gold – to enhance Baylor’s brand recognition. On Saturday, Baylor Athletics unveiled an updated interlocking BU, a new bear logo, the revised colors, an athletics font system and new uniforms prior to the spring football game to kick off the University’s brand transition. The “Baylor United” event was the culmination of a two-year process of Baylor Athletics working with Nike’s Graphic Identity Group. The interlocking BU will replace Baylor’s current institutional mark, which features a silhouetted statue of founder R.E.B. Baylor in front of Pat Neff Hall and the date (1845) when the University was chartered. This logo, which has been used by Baylor since 2008, will now be recognized as a “commemorative mark” and will remain an integral part of the culture in select permanent installations on campus, as well as through special University events and commemorations. Beginning today, the billboard on Baylor’s campus adjacent to I-35 will transition to the new Baylor Brand Mark, while visitors to the University’s website and social media accounts will immediately notice the graphic identity change. 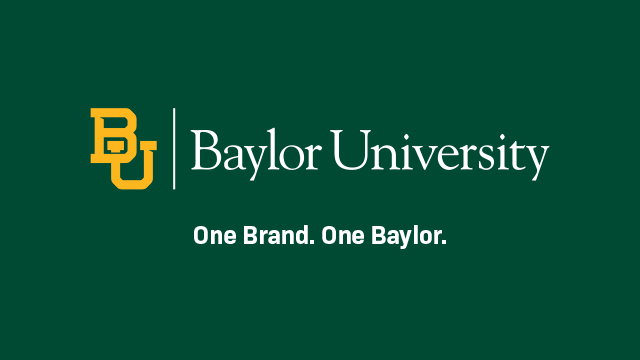 The University’s colleges, schools and divisions will begin transitioning to the new Baylor Brand Mark featuring the interlocking BU immediately, with the use of supplies displaying the previous commemorative mark, particularly those used in recruitment or external-facing materials, expected to phase out by Dec. 31, 2019. Baylor’s Division of Marketing and Communications developed an extensive print and online Brand Guide titled “Baylor United” (www.baylor.edu/brand) that provides more background behind the brand progression, as well as instructions for unifying, building, promoting and protecting the brand. Along with the Brand Guidelines, a Brand Toolbox provides anyone communicating on behalf of Baylor with an easily accessible, user-friendly resource for all official University Brand elements. A limited number of retail products with the Baylor’s new graphic identity are available at the Baylor Bookstore. Additional products will become available in the weeks and months ahead, with the largest shipments arriving in August for the start of the fall semester and football season.